The Peter Johann Band is a 7 piece dance and party band that gets butts movin’. The Peter Johann Band has evolved into a top tier dance band by offering a unique blend of performance background and musical ability that is sure to engage any crowd. Each show is a unique experience filled with spot on harmonies, jazz-influenced improvisation, soulful vocals, and a tight rhythm section. The fun and energy is contagious when the Peter Johann Band hits the stage! The Peter Johann Band has been nominated for multiple Lehigh Valley Music Awards including: Best New Band, Best Cover Band, Best Guitarist, Best Female Vocals, Best Bassist, Best Original Album, Best Original Song, and Best Overall Entertainer. 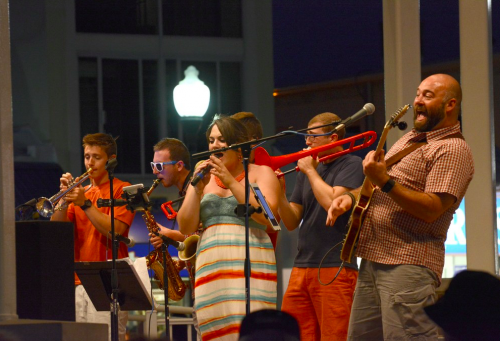 Over the past 6 years they have played at Musikfest, The PPL Center, Tunes at Twilight in Bethlehem, PA, New Year’s Eve at the Historic Hotel Bethlehem, Rehobobeth beach Summer Bandstand, and St. Luke’s 1/2 Marathon to name a few.